By John C. Toman. Posted November 4, 2012, 7:47 PM. A warm November day Sunday was another reminder of this year's hot summer, despite six weeks of autumn already gone. And there's another couple of days like it before the weather pattern transitions to windy, cold and perhaps wet. Temperatures from the latest heat wave have spiked ten to fifteen degrees above normal, and are expected to peak on Monday, when high pressure aloft is at its warmest. Tuesday looks to be a little cooler as the upper level ridge weakens. Some sample high temperatures from Sunday: 92 degrees in Lake Elsinore and Menifee, 91 degrees in Fallbrook, and 90 degrees in Temecula, De Luz, Riverside, Moreno Valley, and Wildomar. Even San Diego's City Heights, not too far from the ocean, registered a warm 89°. Hemet came in at 88°, and Simi Valley at 87°. The mountains and passes were a little cooler, with 77° in Anza and 80° in Beaumont's Cherry Valley. Offshore winds were weak to moderate Sunday, weaker than expected. The National Weather Service cancelled a Fire Weather Watch as a result. 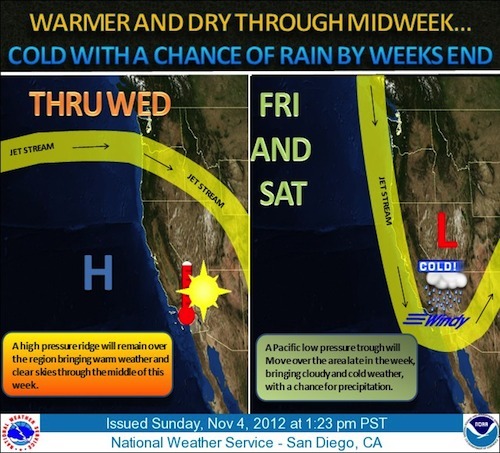 An inland-tracking storm is due in the area Friday and Saturday. The latest weather models aren't showing a lot of moisture, so expect light showers in the inland valleys and coastal areas and snow above 4000-4500 feet. The main impact will be gusty winds and much cooler temperatures, off nearly 25-30 degrees from early in the week. Temperatures mentioned in this article are in degrees fahrenheit. Storm due later this week. Courtesy National Weather Service.